Snowmobile crash scene near Stacyville on Friday, Feb. 22. The crash left one man critically injured. 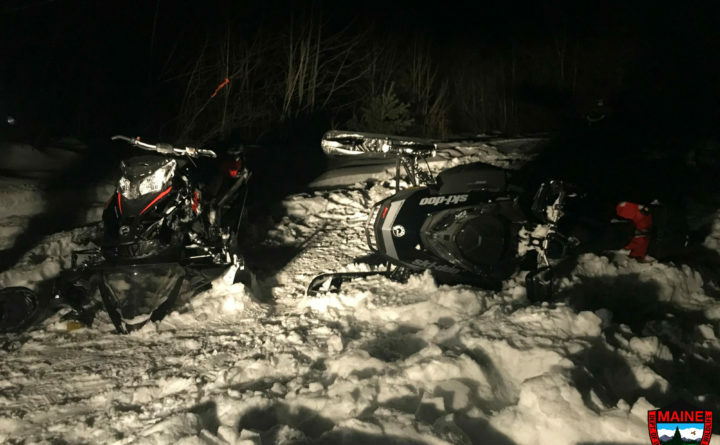 A Massachusetts man is in critical condition after a snowmobile crash Friday night in northern Penobscot County. Duane Carter, 55, of Spencer, Massachusetts, was riding with a group in ITS 83, a portion of Swift Brook Road near Stacyville, when he and rider Keith Sanford, 47, of Benedicta both failed to make a corner, according to a statement issued Saturday morning by the Maine Warden Service. Carter, who was following Sanford, collided with the back of the Maine man’s snowmobile, Corporal John MacDonald wrote. He was thrown from his 2016 Ski Doo, suffering serious injuries in the crash. Sanford suffered a back injury. Both men were taken to Millinocket Regional Hospital, but Carter was later taken to Northern Light Eastern Maine Medical Center in Bangor, where he remained in critical condition. The crash remains under investigation by game wardens, according to MacDonald, who also shared information about another snowmobile crash that happened Friday on Long Lake in Bridgton. In the Bridgton crash, Karissa Baldinelli, 25, was injured after she ran into an ice pressure ridge on the lake just before 4 p.m., the game warden official wrote. She had been traveling at about 60 miles per hour on a well-established trail when she was thrown from her snowmobile after hitting the pressure ridge. “Game wardens say her snowmobile travelled about 120 feet through the air before coming to rest,” MacDonald wrote. Baldinelli, who was wearing a helmet, suffered a broken leg and was taken to Bridgton Hospital by United Ambulance for treatment.